In the struggle to attract today's conscious consumer, better service may be the key. NEW YORK (Fortune) -- Most Americans dread calling customer service, and it's easy to see why. Whether it's the seemingly endless "press 1 now" steps, android representatives, or long waits, it can seem like companies just don't care. So why has this multibillion-dollar industry gotten so bad, and will it ever get better? 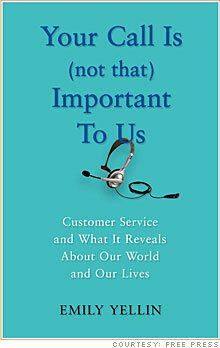 Emily Yellin tackles the question in her new book, "Your Call Is (Not That) Important To Us" (Free Press, March 2009), providing an insider's look at what most companies are thinking - or not - about customer service. Yellin spoke with Fortune about which businesses are getting it right, and what others can do better. Fortune: What has happened to customer service during the downturn? Yellin: I think that customer service is going to be important with the economy the way it is because as companies start to compete about price, service is going to be the one differentiator. Service is starting to become more valued in many corporations, partly because it's not as easy to get away with giving bad service these days with the rise of the big megaphone that the Internet has given customers. Customers are going to maybe take a little more time and really look at what they're getting from companies, and so those companies who have neglected customer service will be worse off at the end of all of this than the ones who have invested in it. Why has customer service gotten this bad? Well, it's a combination of things, but I think that the attitude of companies for the longest time about customer service has been to see it as a cost - to see it as a necessary evil. I think that's where the problem really lies and where the effects of that maybe have not been recognized until the last couple of years. It really reflects in all parts of companies right now, and one thing I've seen is that customer service can be a leading indicator of the financial health of a company. A company's customer service agents sometimes know way before anybody else that there are problems in the company with a product or that customers are defecting, and they know way before the stock price reflects that. If I have to answer that simply, I would say the top. It comes down to the top executives of the company - because if the top executives of the company don't invest in and value customer service, there's no way that even the best call center manager or call center agent or customer service agent can do their jobs in the best possible way. [FedEx's CEO] Fred Smith said it has to be baked into the organization, in everything they do. And [Zappos' CEO] Tony Hsieh said that customer service isn't just a department there - it's part of everything they do. So to answer your question in a short way, I would say it comes down to the CEO. What steps have companies already taken to increase the quality of customer service? Well, I was surprised at how much companies know about what customers think and feel - and how much they understand about the things that we don't like. I think that companies do know a lot about why we get so frustrated. And the hope that I see is that there are places where innovative people are trying to really address the entire customer experience, from the very first time you hear about a company all the way through to if you have a problem with something you've bought or something they've sold. They're really looking at customer service as the entire experience that a customer has with the company. It's a long process, it's a hard process, but the companies who really take that seriously are the ones that are doing well. Can you name some companies with great customer service? The obvious one, the one everybody calls out, is Zappos. That is a great company. But I also went to JetBlue (JBLU), and one good example of their customer service is when they had pretty much their worst situation ever in early 2007 when all the planes were caught on the runway. The way that they handled it is what set them apart: The CEO came out and admitted the mistake, apologized, did what he could to compensate, and also apologized to everybody in the company who was handling customer service for putting them in that position. And so, the idea that the top management pays enough attention to their customer service agents is also really important, and that was a great example, because those are the people who take care of your customers. FedEx (FDX, Fortune 500) has also been known for its customer service for a long time, and the amazing thing to me was how well engineered their customer service is. Just in the same way they engineer and try to get all the efficiency they can in delivering a package, they've done that with customer service and maintained this sort of human touch. At their call center, there were agents who had worked there twenty years, and you just don't see that often. Will companies who don't have good customer service ever have a turnaround? Yes, I think that some of the companies that have been noted for not having good customer service, most notably in the news media and on the Internet, have been forced to pay attention. The two industries that have had some of the worst satisfaction scores from customers are cell phone companies and cable companies. Those companies did a lot of mergers and acquisitions and concentrated a lot on growth and a lot on product development. Those are companies that have neglected customer service, and they're starting to admit it. However, turning a huge corporation around about customer service is like turning a huge ship. It'll take a while. What can companies do to change their service reputation? I think first and foremost, customers want you to be straight with them. So for instance, Comcast (CMCSA, Fortune 500) has said publicly, and I'm paraphrasing, "We neglected customer service. We admit it, and we are trying very hard to change it." The first step is, as always, admitting you have a problem, and then instead of just giving lip service, you really have to get into looking at the systems of your company and how they might thwart good customer service.